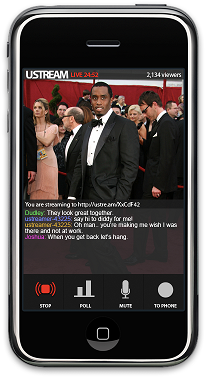 The Ustream Live Broadcaster is a free app that enables live streaming on 3G or Wifi, and users can notify their Twitter communities when they start broadcasting, and interact with their viewers using chat or Twitter through Ustreamâ€™s Social Stream. This is a pretty significant milestone for citizen media – it’s the first live video broadcasting app OK’d for the iPhone, and it puts live streaming within reach of tens of millions of people. In addition to live streaming, the app has social networking features for Twitter, Facebook and Myspace. If you’ve tried out Ustream Live Broadcaster for the iPhone, leave a comment and let me know what you think of it!